El Salvador is the smallest country in Central America, but with a population of seven million, it is also the most densely populated country on the mainland of all the Americas. It is a mountainous country with two mountain ranges running parallel, east to west, and a central plateau between the two ranges. The Pacific Ocean is the South/West border of the country. Located on the “Ring of Fire” chain of active and dormant volcanoes, El Salvador is prone to natural disasters such as earthquakes, volcanic eruptions and hurricanes. From 1980 to 1992 El Salvador was ravaged by civil war, known as the Twelve Year War. The war ended in 1992 when the UN brokered a peace agreement. Tragically, soon after El Salvador began to recover it was struck with a series of natural disasters in the form of hurricanes and earthquakes, which left millions homeless. Like most of Latin America, El Salvador suffers from an extreme division of wealth, with many neighborhoods in cities lacking basic water and/or sanitation services. 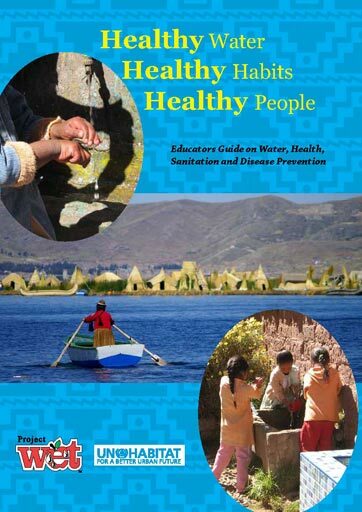 The development of water, sanitation and hygiene educational materials for Latin American countries began in 2010 in partnership with UN Habitat. Through UN Habitat connections, Project WET worked with local communities and organizations to determine priority topics for the educator guides through Writing and Material Development Workshops. Based on suggestions from the workshops, Project WET then customized materials for each project country based on local culture and context. These materials were field tested by select schools in each country to ensure the materials were appropriate contextually and culturally for the specific project regions. Once the final materials were published, Project WET conducted Training of Trainer Workshops in each region with local educators/trainers to teach the instructional methods in the customized guides. The trainers from the workshops then worked with local partners to train other educators on the methods they learned during the workshop and to distribute the materials to their communities. Clean water, proper sanitation and good hygiene form a solid foundation for a student’s health education. This activities guide is designed to enable teachers to take an active role in making a real difference in the lives of children and their families. 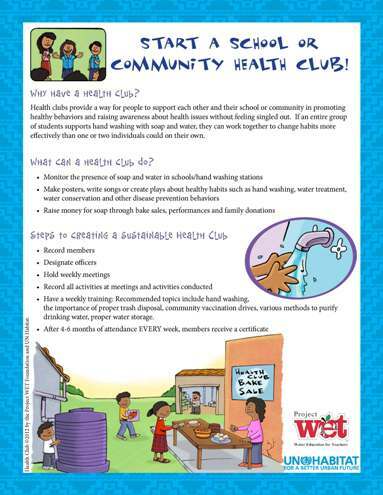 Its pages are filled with engaging ways to impart an understanding about how common water-borne and hygiene-related diseases are spread. In addition to learning how to protect their health and that of their families, students will gain a healthy respect for the important water sources on which we all depend. Good habits lead to good health. And the sooner children begin in life, the better. You’ll feel great knowing that through the activities in this booklet children will gain a healthy start on taking better care of themselves and the sources of clean water that we all need to stay healthy. The illustrations are customized specifically to the local context of each project country to enhance the learning experience for children. 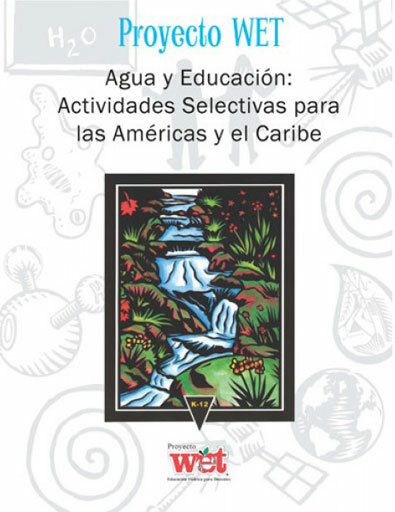 Customized for a Latin American audience and translated into Spanish or Portuguese, this Educators Guide contains seven engaging, interactive activities on various water topics ranging from watersheds to water in our bodies. Activities include Project WET classics such as The Blue Planet, The Incredible Journey and Sum of the Parts. This Guide is perfect for educators who live and work in Spanish- or Portuguese-speaking regions as well as for volunteers or educators traveling to Latin America or the Caribbean. 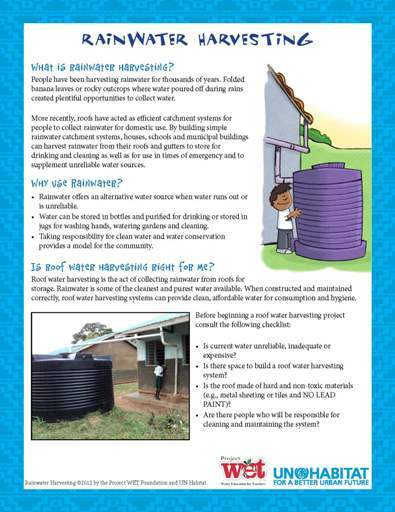 A summary of rainwater harvesting and its components with helpful links.